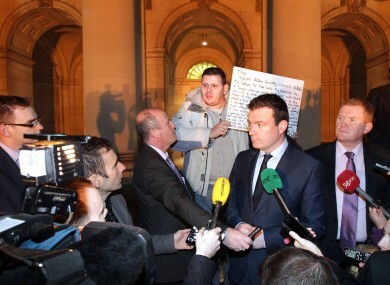 Alan Kelly is interrupted by a man holding a sign as he speaks to the media this evening. THIS EVENING’S HASTILY-convened summit on homelessness at Dublin’s Custom House has ended — with ministers committing to an extra supply of emergency accommodation beds for the capital, and a promising to bring further proposals to Cabinet next week. “Our ambition is that there will be no need for anyone to have to sleep rough in Dublin this Christmas unless they make that choice themselves, for whatever reason,” Environment Minister Alan Kelly said in a statement. Junior minister Paudie Coffey said they had identified immediate, short term responses “and we intend to get working on them”. Kelly convened the forum in response to the death of Jonathan Corrie overnight on Sunday, in a doorway just metres from the gates of Leinster House. Opposition spokespeople, Dublin council mayors, representatives of various Government Departments and agencies, and heads of NGOs all attended. The first session got under way at 3pm, with participants arriving for meetings over staggered 45 minute periods. These are the “targeted measures” decided upon at the meeting, according to the Department of the Environment this evening. Ministers will be directing local authorities in Dublin to put 50% of all new housing allocations towards vulnerable groups including those long-term homeless and people with special needs. This will be put in place for the next six months and will provide homes for over 300 people. Bring a number of proposals to cabinet following today’s meeting for short-term actions. 164 additional emergency beds had already been confirmed for the capital, in advance of the renewed focus on the issue of homelessness this week. 38 of those are already in place, and a further 106 were due to come on stream by the end of next week, with the remainder available by January. The 220 figure includes the 164 beds already announced, a spokesperson for the Department confirmed this evening. The latest official count of rough sleepers in Dublin, carried out last month, found 168 people bedding down for the night in doorways, alleys and in parks. Speaking on his way out of the meeting, Archbishop of Dublin Diarmuid Martin said it had been ”very useful”. Earlier today, Dublin Lord Mayor Christy Burke — a long-time campaigner on the issue — said he would be “fully totally annoyed” if nothing concrete arose from the meeting. “The day of talking is over it’s a day of action, and lets hope action takes place,” Burke said. Later, he said he had never been at such a positive meeting. “That tonight is a breath of fresh air,” he told reporters. Speaking earlier this week, Taoiseach Enda Kenny said it would be “very difficult” to get all rough sleepers off the streets, given the complexity of some peoples’ cases. Email “"No need for anyone to have to sleep rough in Dublin ... unless they make that choice themselves"”. Feedback on “"No need for anyone to have to sleep rough in Dublin ... unless they make that choice themselves"”.